Are you hungry? Let Arps Dairy help!! What’s for dinner?!! We have all either asked it or have heard it said. Well take a break from the usual question! Arps has you covered. Try a couple of recipes we have found and let us know how you like them! One rule, use Arps products! Remember with every meal you can also add a nice glass of Arps Milk (try the Farm Fresh, Its delicious). Even an evening snack of chips, add some Arps French Onion chip dip it makes every bite better. We want to help you out and make family time enjoyable! 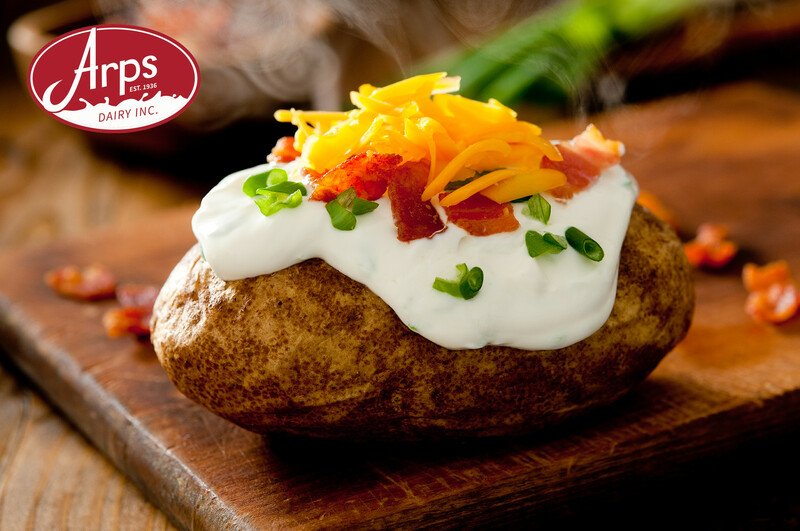 Start with a clean potato and cut small (1/4 inch) slices to the all the way to the bottom edge of the potato. Basically, slice as close as you can without going completely through the potato. Mix melted butter. olive oil, pepper and salt together in a small bowl. Add the potatoes to a shallow baking dish. (I used a round glass pie plate and it worked perfectly.) Drizzle the butter mixture over the potatoes. Bake the potatoes for 40-60 minutes until the edges are brown and crispy and the middle is soft. With cooking spray, spray a large 5-6 qt. crock pot. In a pot cook the macaroni according to directions, leaving al dente, about 3-4 minutes shy of being done. Drain and rinse with cold water. Place the macaroni in the crock pot. Add in the cheeses, sour cream, cream cheese, mayo and seasonings, stirring to combine. Pour the evaporated milkover top the mixture. Cook on low for 2 hours, stirring once half way through.